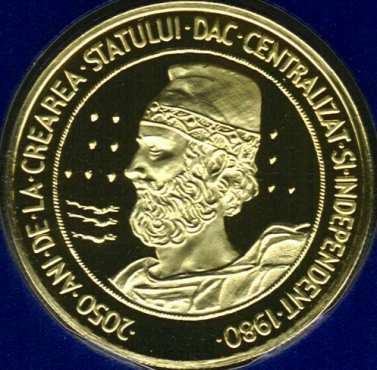 The coin belongs to a set of four - two silver and two golden coins - celebrating 2050 years since the political union of the Dacians into a single state, meant to be struck in 1983 on August 23rd, the Romanian national day of the time. The set was struck at the Franklin Mint in Philadelphia (in Pennsylvania, United States of America). Trustful sources assume 6.500 pieces but others raise the number to 7.500. Anyway, it is very rare. 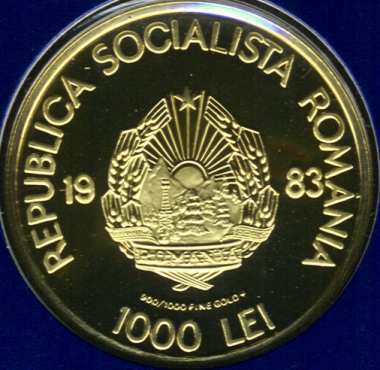 It seems that the production expenses were supported by the American mint, Romania receiving the royalty rights and a small number of coins. Another golden coin of the same series can be seen on the previous page. 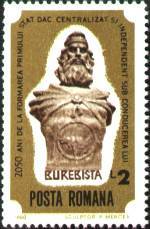 For almost 40 years, since the TRANSYLVANIA OF OURS coin in 1944, Romania had not struck gold when this set appeared. The gold coins in the set have 7.2 respectively 14.4 grams of 90% gold, i.e. 100 respectively 200 grains of pure gold or 5/24 and 10/24 Troy ounce.